New Delhi, Mar 18: Manohar Parrikar, four-time Goa Chief Minister and former defence minister passed away on Sunday evening after battling pancreatic cancer for over a year. The Centre announced a national mourning on Monday, declaring that the National Flag would fly half-mast across the country. 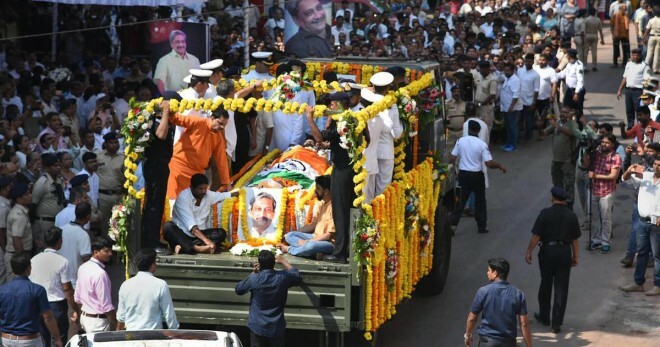 Hours after the Goa Chief Minister's office tweeted confirming Parrikar's death, a program plan for his final journey was tweeted. Goa had announced a seven-day mourning after the chief minister's death. All schools and educational institutions in the state will be shut on Monday and all examinations have been postponed. His body will be kept for public viewing until 4 pm after which the funeral procession to Miramar area in the capital will be held. The last rites will be performed at around 5 pm at SAG grounds in Campal, approximately 4km from Panaji. Prime Minister Narendra Modi, Defence Minister Nirmala Sitharaman paid their last respects to Parrikar and interacted with his family. Chief Ministers of various BJP-ruled states are also expected to reach the state.